Let's face it, I spend most of my life googling things. Be it a book; a song I'm humming but don't actually know the words to or how to spell embarrassing because I can't and (coincidentally) google is closer to me than my dictionary — google is my friend! 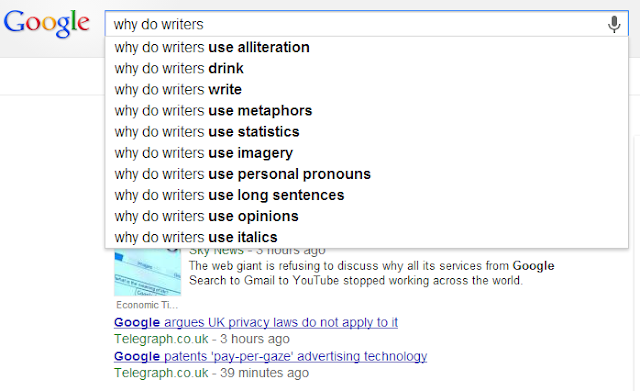 So, recently, when I was searching the bowels of the internet, I came across some questions about writers and thought I should help answer them, thus eliminating the need for google to suggest them to me. Or something like that. Anyway. Let's begin this series with the biggest question of all: why. Google, what are the searches asking today? Why do writers us alliteration? I'm not sure all writers use alliteration all of the time, but if you mean in a book it is probably for one of two reasons! Firstly, it might be that they are trying to emphasize the phrase and make it sound almost lyrical. The far more interesting and likely reason is that their keyboard is jammed again, and halfway between prying out a pop-tart crumb with a bobby pin, their fingers slipped and created an alliterative allusion that they think is alright but can't bring themselves to delete regardless of quality because it's 3am in the morning and the only real coherent thought they are having is WORDS, OMG. Why do writers use italics? This one is slightly more hard to answer (as you may know already, there's no italics key that crumbs might get stuck under!) but again there are two reasons. The first is a format decision, often made either by a writer or by a friend or a houseplant or an editor. Italics can indicate the narrative is a detailed flashback, or a letter, or inner most thoughts. The final reason is to assist in snark on the internet, because italics do snark very well. Phrases like "Your word-count is interesting" and "Oh no, I'm sure your bum doesn't look big in that book" sound pretty snarky with italics and what else is there to do with your time but think about this kind of thing anyway. Why do writers use opinions? I'm not sure what opinions are being referred to here, but I'd say that we probably use them because we are about three sips away from a caffeine overdose at any given time of the day and that tends to make you think a lot of things would be fab if you wrote them down in some kind of ordered fashion, maybe with page numbers and dialogue tags and so on. Why do writers drink? Um, I think this has a lot to do with the caffeine overdose thing to be honest. Some writers just attempt to push back the jitters, pour themselves some kind of beverage, and pretend they don't notice the way their eyelid is twitching. I favour pop-tarts and gummy bear shampoo but everyone has their own thing. Why do you think writers do the things that they do?